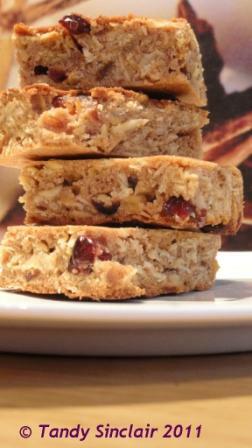 I have a handwritten recipe for cranberry and oat slices that I must have copied down when at a friend a long time ago. If it had been done in the past two years I would have made a note from where I copied it, as I do not want to copy other people’s recipes without acknowledging where they are from. However, I have been looking for a perfect before breakfast snack for some time, and I was hoping this was it. Given that I don’t read a recipe until I start the process of actually making it, I expected the slices to be crunchy, but, as the recipe contains eggs, what you get is a cake like slice of pure breakfast delight. I ate two before they had cooled down and if I were to try these again I may just substitute the dried fruit for some dried cherries and even add some nuts. If this recipe is yours, please let me know, so that I can thank you properly on my blog. Hello Rita 🙂 Enjoy the oat slices and please let me know how they turn out! I will certainly try these. Thanks. Hi Tandy, these are ideal for Jess, I will make the substitutions that you have and use some slivered almonds to boost the protein for her. Hi Tandy – these sound like a good alternative to breakfast which I don’t normally eat & which I must now start doing. Have a lovely holiday. Fabulous recipe – I love snacky things like this. Yay, you going on holiday? sounds lovely. i love oatmeal & dried cranberries. thanks for sharing! thanks for the visit 🙂 They were very moreish! they made a great breakfast for the whole week!